It’s time to redefine“Unicorn”.It’s not about a billion+ valuation,as crazy high as that seemed 5 years ago. Now it’s about $1b in ARR. 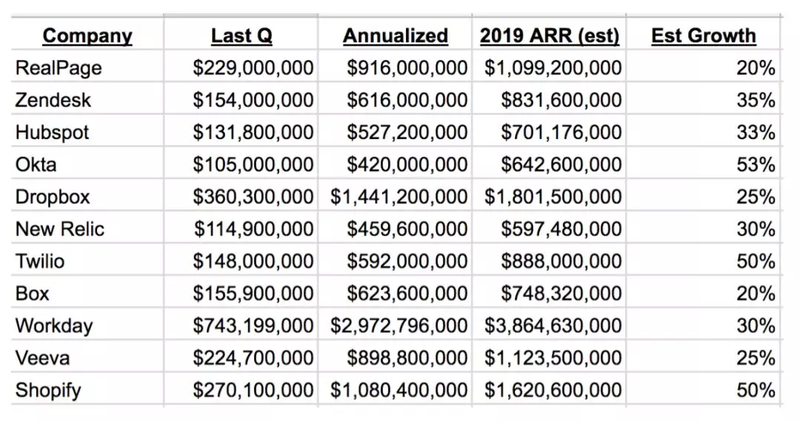 The above chart is a rough attempt to estimate 2019 ARRfrom some of the top Cloud/SaaS public companies.The estimates will allbe off / wrong a bit,but they are all directionally correct. What you see here is every leader iscoming up on or has cruised past $1,000,000,000 in ARR. Why?The Cloud is 1000x larger than 10 yearsago. How?SMBs are all moving to Cloudapps.And enterprise/CIO budgets have moved an additional 10% of their$1.5T+budget to Cloud.The leaders benefit here. So?It means you can do it.Maybe not$1b in ARR.But the odds you can get to $100m in ARR are far,far higherthan ever before.